From its 1829 emergence in upstate New York as just another obscure religious sect, the history and progress of the Latter Day Saint Church is a long and colorful one. It involves angelic revelations, political intrigue, theocratic ambition, a faith based upon divine sexuality, and dreams of American empire. It initially rejected the orthodox Christian institutions of 19th century America and estranged itself from the larger society to the extent that controversy dogged it where ever it went. The LDS Church's flight from persecution into the wilderness of the West is a significant chapter in the Western colonial effort of the United States in the mid 1800's - as well as the consolidation of a religion that anointed itself as "the Only True Church." Today, in a marked departure from its former explicitly elitist organizational posture, the Church now expends millions of dollars annually in highly sophisticated proselytizing campaigns using the mass media to appear more "Christian" than the Christian Church. One of the avowed goals of present Mormon leadership is to finally gain mainstream religious status for the LDS Church in this generation, an end to which it is gaining ground steadily. An old argument about whether something or another is right or wrong ends with the well-worn cliche "well, x million people can't be wrong". If one accepts this reasoning at face value, then the Mormon Church's growth rate in the past 100+ years is often cited by LDS apologists as a phenomenal vindication of its' divine origins and truth. As noted by researchers in the late 1990's, in 1880 there were around 160,000 Latter Day Saints and sixty more years (to the year 1940) would pass until the Church surpassed the million member mark. But only 40 years later - 1980 - that number soared to over 4.5 million, and the Church in 1999 supposedly had risen to just over 10 million members. It now claims to be around 15 million in membership. Some of these same researchers projected that Church membership could rise to as much as 63 million in another 100 years, with a growth rate of 30% per decade (and more liberal estimates place that possible number at a staggering 267 million). However, since church membership statistics are supplied entirely from LDS sources and since credible information shows that their reporting is seriously inflated, the numbers are actually be much lower. The growth spurt noted in the 1980's has all but actually stopped. Part of this evidence indicates that among many local LDS congregations for the past decade there has actually been a serious decline in growth and that the church itself - having been plateaued at the 15 million mark for some time - is finding it impossible to inflate their reports any longer. There is much anecdotal evidence that the church hasn't removed from its membership count the thousands of people leaving it. 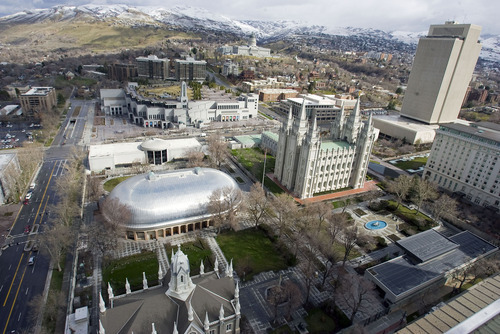 Some sociologists estimate the church may actually have declined to as few as 5 million, with U.S. Mormon birth rates being the principle driver of church growth and fewer converts dwindling to a trickle. Much of this growth among converts - estimated by some to as few as 1 in 4 of the actual church membership - is attributed to the various moral and social emphases that LDS members utilize in their efforts to reach the masses. Every personal effort they make is to intentionally "friendship" the prospects that they seek to recruit. They provide a maximal amount of positive regard, warm concern, and personal attention to them, so as to provide personal impetus for seeking and joining Mormonism. This socialization effort usually brings the most fruit for the well over one million Mormon missionaries presently scouring the world for new converts, who use these personal contacts to great effect that is, however, often nullified due to missionary failures. With this kind of non-doctrinal approach often comes great success among the churched who would never consider Mormonism any other way, as well as the standard approach of sharing the "restored Gospel" to non-believers. Their introduction to prospects of a Mormon dedication to strong moral principles, diligent industry, and conservative family values has been a compelling force in our crumbling postmodern civilization. This has attracted a lot of its membership who were formerly adrift in the amoral wilderness of modern society and nominal Christendom. For them, if an upright and sober lifestyle of faith can be found anywhere, the Latter Day Saint Church would be the place. Its vast social network that provides support, structure and community along with an exclusive channel to God upholds an apparently wholesome global society populated by millions of purposeful Mormons. Certainly those ten million people can't be wrong! some would say, including many Christians. Through the clearly sincere and earnest lifestyles and testimonies of many a Latter Day Saint, both Christians and non believers are being confronted in settings as diverse as local high school Christian fellowships to Capitol Hill with their affirmations that they too believe that "Jesus is the Savior". And when such occurances as that Time magazine article in April, 1993 that gave a statistical nod to Mormon church growth by comparing it with that of orthodox Christian groups (placing it just behind the Church of God - Cleveland) the lines of distinction have blurred even further. Mormonism teeters on the threshold of achieving it's goal of mainstreaming in the eyes of a skeptical public and a credulous Christian church, which it views as apostate. The problems we have with the advances of the LDS Church are really quite easy to understand. If the teachings of the Church of Jesus Christ of Latter Day Saints truly were drawn from sound Biblical precept, we would not be concerned with their march towards becoming the next major world religion or - failing that - the divine entity in an American theocracy. If the Church's politely understated claims to divine supremacy over Christianity were legitimate, we would not object to their "restoration" of supposedly lost spiritual authority. If the Church's passionate assertion of being "brothers in Christ" to orthodox Christian believers was based upon an authentic spiritual unity with them, we would eagerly embrace all Latter Day Saints as fellow believers and pilgrims journeying to Zion. If these claims were all found to be genuine, we would committing an unimaginably intolerable and insidious disservice to Mormons everywhere. The greatest problem of all is this: they are not. For all of the sincerity and social presence that they may muster, the hard cold truth does not support their arguments, no matter how moving, engaging or intellectually stimulating they may actually be. There is deception of a profound order afoot here as the collusion between Mormons, the larger culture and the Church continues and the stakes are high: temporal life and eternal salvation. We wish to bring light to this often completely overlooked dark side of the organization that Latter Day Saints everywhere view as "the restored Church." What is the gospel that Latter Day Saints stand for? Why does the secret history of the church prove they are a cultic group? Is the Book of Mormon really "another testament" of Jesus Christ? What does the Bible say about the teachings of the Mormon Church? Does God Need Prophets & Priesthoods? The LDS Church, "Officially Speaking"